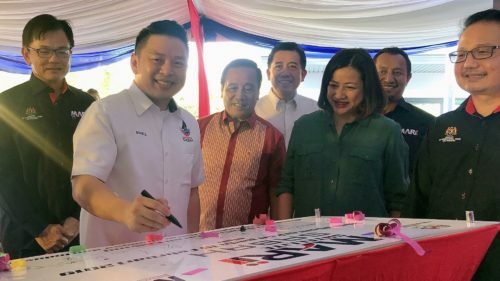 MARii’s first centre outside of the Klang Valley opened in Kota Kinabalu yesterday, its first ever under the MARii Satellite network, to allow for more extensive reach for technology adoption within the automotive, robotics and IoT (Internet of Things) sectors as well as overall mobility. MARii Satellite Sabah was launched yesterday by Minister of International Trade and Industry, Datuk Darell Leiking. The six-story MARii Satellite Sabah houses advanced product design, process design, data analytics and special training facilities, developed to immediately allow participation of Sabahans in advanced technology applications for automotive manufacturing, aftersales and overall mobility, which can be commonly utilised in other sectors such as furniture, agriculture, plantation, oil & gas and fisheries. “Since its establishment as the Malaysia Automotive Institute (MAI), centres of competency have been established such as MADeC, MAReC and NETC within the Klang Valley. Technology application that has been developed by MARii is not just for the automotive sector, but can also be applied within numerous sectors in Sabah”, said Darell. He added that yesterday’s materials and manufacturing technology is transforming towards more advanced materials such as composites, carbon-fibre and graphene, while manufacturing technology is increasing its levels of automation that requires the adoption of robotics and IoT. MARii CEO, Dato’ Madani Sahari further explained that the MARii Satellite bridges the geographical divide between Peninsular Malaysia and Sabah, as it allows access to technology adoption which are specific to the needs and requirements to the localities and communities in Sabah. “The Satellite is also a gateway for Sabahans to access MARii’s expanded network of expertise and other facilities throughout the country”, he added. The MARii Satellite Sabah is located in Donggongon Avenue, only 15 minutes from Kota Kinabalu International Airport and the Kota Kinabalu city centre.